All foreigners visiting one of the host cities are required to register with police upon arrival. Here’s everything you need to know. What’s the registration rule about? Every foreigner who travels to one of the World Cup host cities between May 25 and July 25 is required to report to police and register as a visitor. The list of host cities is as follows: Moscow, St. Petersburg, Volgograd, Yekaterinburg, Kazan, Kaliningrad, Nizhniy Novgorod, Rostov-on-Don, Samara, Saransk and Sochi. Yes, it does. This new rule applies to every individual from every country with only one exception: It does not apply to the championship participants and FIFA representatives, as well as to representatives of its subsidiaries and associated organizations and confederations. Unless you are a player on one of the national teams, or a coach or a FIFA functionary, the rule applies to you. The reason for traveling is also irrelevant. Even if you don't care about football, you still have to report your arrival to police. I’ve often traveled to Russia and registration was never required. Are you sure that I need to do this? Yes, a decree signed by President Putin overrules all norms regulating migration rules in the country. Even if registration is normally waived due to international agreements between Russia and your home country, such rules don’t apply between May 25 and July 25. Do I need to register if I stay in Russia for only one day/night? No. The decree obliges foreigners to register only if they stay in Russia (in one of the listed cities) for more than three days. If you come to Russia for only one or two days, then you don’t have to register. I already registered in Moscow, and now I’m traveling to Sochi. Do I need to register again? Yes, if you travel to any of the listed cities for more than three days then you need to renew your registration. Returning to a city where you already have registered does not require repeated registration if you do not change your place of stay. If you stay in a hotel, a hostel, a sanatorium, or any other type of official hospitality venue, then forget it. Official businesses hosting foreigners during the 2018 FIFA World Cup Russia™ will handle the process for you and do not require your presence. In case you have doubts about whether a particular place of stay runs the service, then ask the receptionist. They are instructed about the registration rule and handle it very well. If you rent an apartment, a room, or stay at your friend’s, or move in with your relatives living in Russia, then you are required to register on your own. You need to be accompanied by the owner of the property in which you stay. He must have his passport. Open maps, find your city, and search for “МФЦ” or “ОМВД.” Together with your landlord, visit the closest office to your place of stay. Upon arriving at one of the offices, ask a person at the front desk to assist you in registration. The whole procedure usually takes no more than 10-15 minutes but requires paperwork done on the spot. If you run into any trouble, ask a receptionist to assist – it’s their job and they are very friendly. How do I know if the procedure is completed? As soon as you receive this paper with your name on it, then you have successfully registered. How soon should I register after arriving in one of the listed cities? Within three days. National holidays and weekends also count. Even if you arrive on, say, Friday night, you will have to register by Monday. For this purpose, all the registration centers remain open on weekends and holidays. What time do the registration centers operate? All centers can be found by searching for “МФЦ” and “ОМВД,” and they will be open from 8 a.m. to 8 p.m. during the World Cup. Beware: the officer responsible for registration might arrive a little later and depart a little earlier than the specified time, as well as close for a lunch break somewhere around noon. The safest time for a visit is between 10 a.m. to midday, and from 2 p.m. to 6 p.m.
What’s the penalty if you fail to register? 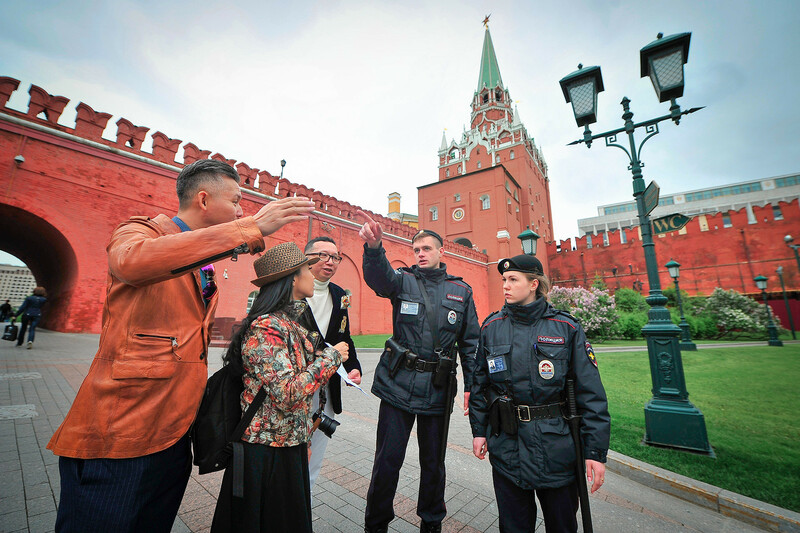 If after staying for three calendar days in one of the listed cities you’re stopped by the police for a routine ID check and fail to present confirmation of your registration, then you might be fined between $32 (2,000) and $80 (5,000 rubles). This might not be a severe punishment, but you have to remember that a bad mark for violation of Russian migration laws might be put into the police/border control database, and this will very likely hinder your future visits to the country. This is not the only restriction Russia is imposing during the 2018 FIFA World Cup™. Check the full list here.